The Trusted LASIK Surgeons directory only lists surgeons who have extensive qualifications and experience. We estimate these Orlando based LASIK laser eye surgery, refractive eye surgery, cataract surgery, eye doctors are among the top 1% performing vision correction in the United States. These Orlando, FL, eye surgeons also serve international patients. 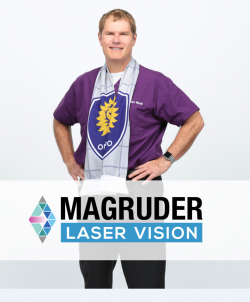 Orlando LASIK Laser Eye Surgeon Dr. G. Brock Magruder, Jr., M.D. Dr. G. Brock Magruder, Jr., M.D. in Orlando, FL, has extensive qualifications that we estimate put him among the top LASIK and refractive surgeons in the United States. Dr. Magruder's exceptional qualifications are listed via the link above. Orlando LASIK LaserVue serves Central Florida, Orlando, Winter Park, College Park, Windermere, Altamonte Springs, Maitland, Lake Mary, Daytona Beach, and Cape Canaveral. Florida, the US and international patients.